PT Toyota Motor Manufacturing Indonesia (TMMIN) inaugurated TMMIN Learning Center, a training facility located at the Toyota factory in Karawang area. Facilities aimed at improving human resources in TMMIN spent IDR 23 billion investment. Training facility was established on an area of ​​3.700 square meters. Toyota's factory to design a comprehensive training curriculum is not only about the production process but also Other aspects such as knowledge of safety standards. TMMIN Learning Center has 266 teachers who have held the Toyota Global and Regional certification. 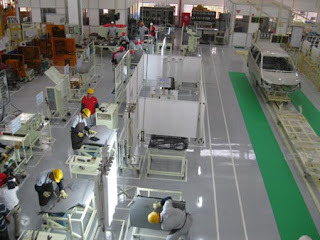 This training center has excellent facilities which are equipped with a dynamic simulation of a mini production line. With a mini production line, training participants can practice and feel like being in production activity in the real plant. In addition to dynamic simulation, TMMIN Learning Center is also equipped with classrooms and equipment static simulation. The existence of the entire facility is intended to enhance the skills and knowledge of employees. In the future, TMMIN Learning Center will be used by our suppliers, and do not close the opportunity for students and surrounding communities. "We believe that the development of human resources is of great importance in supporting the economic development of Indonesia. For that, we hope that the inauguration today TMMIN Learning Center can be interpreted as a manifestation of Toyota's contribution to the development of human resources in Indonesia, "said Masahiro Nonami. The event was also attended by Director General of the Ministry of Manpower and Transmigration, Abdul Wahab Bangkona; Karawang Regent, Ade Swara; Managing Officer of Toyota Motor Corporation (TMC), Naoki Miyazaki, and President Director of PT Toyota-Astra Motor (TAM), Johnny Darmawan.